An exceptional stone built four bedroom detached property set in a picturesque rural location with open views. Bespoke breakfast kitchen by ‘Simpsons of Colne’ with Aga range cooker and log burning stove. High tech air source heating system, detached double garage, driveway for several vehicles and attractive gardens. Solid oak entrance door and glazed screen to side, solid Dura Limestone tiled floor, LED lighting, rear three panelled full height window, feature solid oak sweeping staircase to first floor with turned oak balustrade and matching hand rail. Two piece suite comprising Dura Limestone tiled floor and walls, closed couple low suite w.c; bracket wash hand basin, two transom windows. Solid floor, six transom windows, recessed fireplace with solid sandstone hearth, TV aerial point. Dura Limestone tiled floor, three panelled casement window. Dura Limestone tiled floor, part-glazed rear door, single drainer stainless steel sink unit, fitted wall and floor cupboards. Fully fitted by Simpsons of Colne in walnut comprising shaped base units and matching wall cupboards with concealed lighting under and ‘Silestone’ working surfaces, range of fitted quality appliances including Aga two oven electric range with ‘Silestone’ splashback, extractor canopy, induction hob unit, two drawer dishwashers, refrigerator, freezer, single drainer two bowl sink unit, island workstation with combination microwave, ‘Silestone’ working surfaces, wine chiller. Three panelled full height window to dining area, feature carved sandstone fireplace with log store under and enclosing ‘Morso’ multi-fuel stove, built-in oak display cabinet to side of chimney breast. Dura Limestone tiled floor, eight large picture windows to three elevations incorporating two double French opening doors to side garden, TV aerial point, vaulted ceiling with exposed beams, two ‘Velux’ windows. Wide sweeping staircase to first floor with solid oak balustrade and matching handrail. A galleried landing, sliding sash window, telephone point, LED lighting. Side sliding sash window, two front windows. 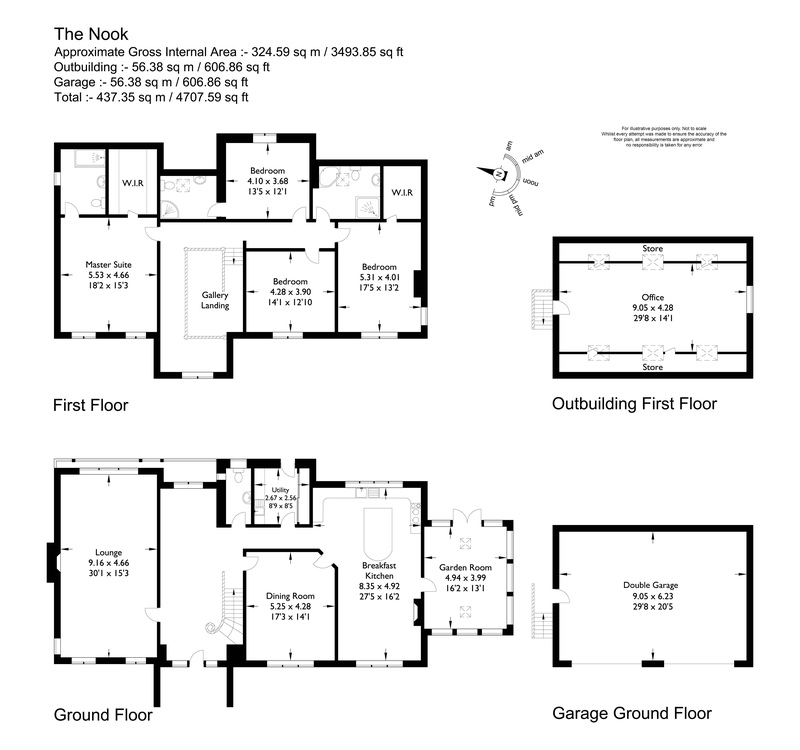 Three piece suite comprising wet shower area with rain head shower, pedestal wash hand basin, close couple low suite w.c; window, Dura Limestone floor, LED lighting, extractor fan, recessed heated bathroom cabinet with mirrored front and side illuminations, ladder towel rail. Three piece suite by ‘Villeroy & Boch’ comprising low suite w.c; circular wash hand basin on marbled plinth, Dura Limestone tiled floor, Limestone tiled walls, shower cubicle, ladder towel rail, mirror with side illuminations, ‘Velux’ window. Window, folding loft ladder to roof space. Two windows, TV aerial point. Four piece suite by ‘Villeroy & Boch’ comprising double shower cubicle, bracket wash hand basin, close coupled low suite w.c; corner bath with hand held shower, recessed bathroom cabinet with heated mirrored front and side lighting, electrically operated ladder towel rail, extractor fan, ‘Velux’ window, marble tiled floor and walls. A two storey detached double garage constructed of course stonework with pitched slate roof. The ground floor provides double garaging with twin electrically operated up and over doors. Lights and power installed, side personnel door. The first floor is accessed via an external stone staircase with wrought iron balustrade. Excellent open room which could be used as occasional accommodation, office or gym, three sealed unit double glazed ‘Velux’ skylights to front elevation and three sealed unit double glazed ‘Velux’ skylights to rear elevation. Four access points to roof storage, sealed unit double glazed sash window to gable elevation, half glazed timber personnel door. Light and power installed. The property has two separate entrance gateways, one with a golden gravel driveway leading to detached double garage with electric up and over doors. There is a large additional garden area to the side of the garage where there could be a possibility of further car parking. A second driveway leads to further golden gravel parking. To the rear of the property is a large timber store place and plant room housing the borehole filtration system and the air source heat unit. Mains electricity, borehole filtration system for water, septic tank for sewerage. Air source heat pump for heating and hot water.